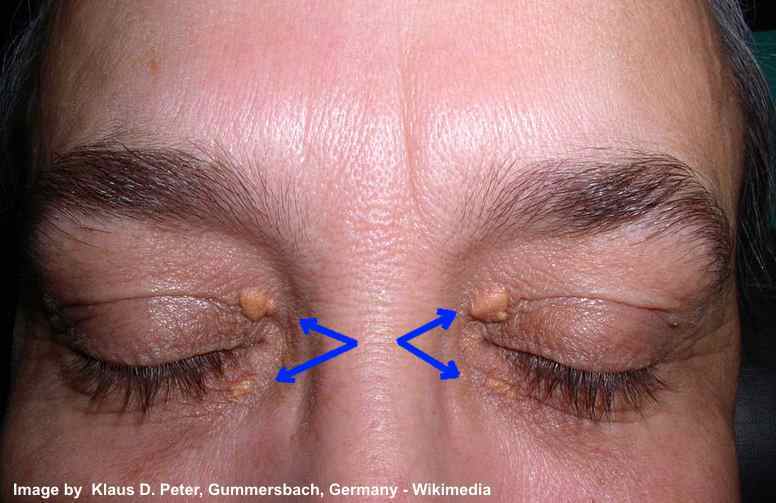 Xanthelasma occur in both men and women and are more common after the age of 40. Research has established that these yellow plaques are deposits of cholesterol and are linked to higher than average cholesterol levels in about half of the cases. They don’t interfere with the vision and are soft and painless, so many people ignore them. Some choose to remove them for aesthetic purposes and don’t give it much thought, potentially missing an important warning sign. When removed, they often reoccur. A Danish based study (the Copenhagen City Heart Study) looked at the correlation between xanthelasmata and heart disease in the general population. The research team, led by professor Tybjaerg-Hansen, reached some conclusions that will change the way many people and clinicians view these seemingly harmless spots. A large prospective study included 12,745 people aged 20 to 93 years, who were free of ischemic heart disease at the beginning of the study. The participants were followed from 1976-8 until 2009. In all age groups, the risk of heart attack, heart disease and death increased significantly in the presence of xanthelasma. Both men and women with the yellow eye lid marks were more likely to suffer a heart attack or die within a 10-year period. Generally speaking, men are inherently more prone to develop heart disease. The study found that men aged 70 to 79 years were at the highest risk, and the risk was further increased by 12% in the presence of xanthelasma. Women with xanthelasmata were 8% more likely to develop a heart attack compared to their counterparts without the yellow patches. Since women have a smaller inherent risk of developing heart disease, xanthelasmata have a larger prediction value in this group, as explained by the authors of the study. The study concluded that xanthelasmata predict risk of heart attack, ischemic heart disease, severe atherosclerosis and death, independently of other risk factors, such as smoking, high blood pressure, cholesterol levels and obesity. The findings are believed to assist with the diagnosing of heart conditions, and could be particularly valuable in places where access to laboratory facilities is scarce. If you notice yellowish marks on your upper or lower eyelids, it would be recommended to have your plasma lipid (fat) levels checked. As the plaques can be an indicator of high cholesterol, consider lifestyle and diet changes to support your heart and overall health. The stuosis and death, independently of other risk factors, such as smoking, high blood pressure, cholesterol leveloratory facilities is scarce. o develop a heart attack compared to their counterparts without the yellow patches.